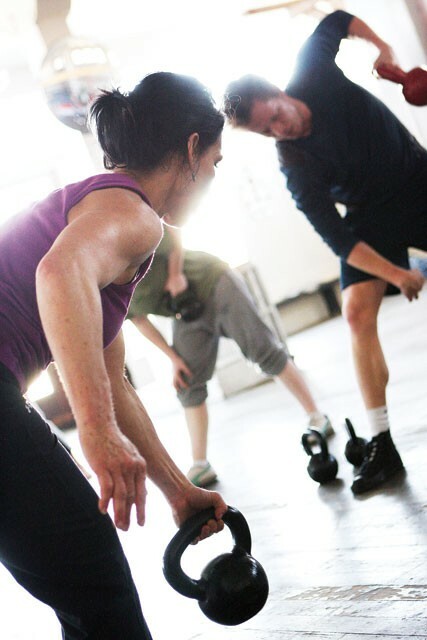 Raoulene Polillo leads kettlebell workouts at Rick Wellivers Spokane Boxing. I spent the holiday season doing a really terrible job of holding myself accountable for working out. The plan was to work in exercise around all the various and sundry engagements and responsibilities. The idea was to try out a bunch of home gym solutions whenever I had a free second. But what finally convinced me was when Rick Welliver from Spokane Boxing approached me and said his gym had a kettlebells instructor and that I’d be crazy not to check them out. So I did. The instructor, Raoulene Polillo, was nonchalant when she asked me my fitness level. It was 11-ish on a Saturday morning, before most of Welliver’s students had arrived for their workouts. The gym seemed almost sleepy. I told her I was in decent shape. Better with cardio than strength. She handed me a big, bright red iron ball with a handle on one end. It weighed 24 pounds. The class, milling about, slowly lined up shoulder-to-shoulder, single file, facing Polillo. The workout felt old-timey, with a focus on squats, deadlifts and clean-and-jerk-type motions. Core work included swinging the bell around like an 18th-century Russian strong man. Which I think is the point: kettlebells have been around since the 1700s, and after all the Thighmaster gimmickry of the last 20 years, this is meant as a return to simple weight and range-of-motion based fitness. Point is: I got murdered by remedial kettlebell. I waddled to my car. When I got around to researching the science on kettlebells, it backed up my experience. A late-2009 University of Wisconsin-Lacrosse study found athletes burning up to 400 calories every 20 minutes in an intense kettlebell workout, numbers researchers cite as being equivalent to running six-minute-miles. Kettlebell enthusiasts point to a 1983 study that showed college students who trained only with kettlebells improved their scores more than those who trained specifically for a broad range of fitness tests that included pull-ups, standing broad jump, 100-meter spring and a 1K run. I’ll say this, though: It’s the kind of workout that’s best in groups. Polillo kept the tempo up without being a drill sergeant and was there to help explain how to maximize the effect — the importance of keeping your knees above your ankles during squats, for example. She kept my form correct, and the session was more intense because of it. The second week was still exhausting, and I ended up sore in all the right places, but I was walking normally afterward, which I view as a small victory. I’m on my way to passing remedial kettlebell. It’s a nice feeling. To read the first installment of “A Year of Perfect Health,” click here.